We are a leading Manufacturer of kumkumadi oil from Ahmedabad, India. 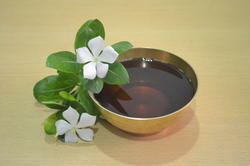 Kumkumadi Oil is Ayurvedic herbal oil used for face massage. It is helpful to improve skin texture, complexion and also to relieve skin problems such as acne, scars etc. Kumkuma means saffron, which is the main ingredient of this medicine.